Improved Energy Consumption and Acoustic Levels. Gross Shipping Weight 207 LBS. Net Weight (without bottles) 174 LBS. 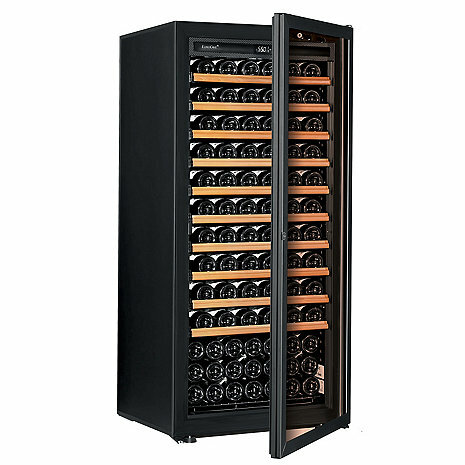 EuroCave Confort Viellitheque V-264W WINE Cabinet - please let me know the external temperature this cooler needs to be stored. Would like to put it in an unfinished basement, which gets to be about 40 degrees in winter. Does this need a filters? BEST ANSWER: I have just received my cooler so there is no long term experience, but so far I am delighted with the product. According to the specs the unit will perform normally even cooler than 40 degrees. It does need filters, which are simple to install and change. A package of 4 is recommended with the purchase, and the specs say they should be changed yearly. You didn't ask, but so far I think the advertised capacity is on target. I am 3/4 full with a variety of bottles and have seen nothing that suggests I won't be able to store at least 140 bottles. Not sure about the storage temperature (we live in Southern CA so no basement) but it does tequire a small charcoal filter (comes with one). Eurocave is known to handle ambient conditions from freezing to the mid 90's. Most Eurocave units do need a charcoal filter. can I cancel this order because it's not going to fit my restaurant office.. ? I am looking for a 30" wide cooler with about 60-65 inch height, is this size available? BEST ANSWER: The EuroCave Premier M Wine Refrigerator would fit that space as it is less than 60 inches tall and only 27 inches wide. Please note that it is over 27 inches deep and requires 3 inches of clearance in the back for airflow. EuroCave refrigerates do cost more than other brands but it is well worth the money. Love this product, BUT we have two of the racks constantly popping off the rail on the right hand side in the back. This keeps happening with even only a few bottles on the rack. Has anybody had this happening and if so, how can it be fixed? Thanks! BEST ANSWER: Hi Birthe - I had the same problem. My first approach was to remove the problem shelves and an equal number of shelves without the issue and put each in the other's place. That resolved one of the problems. I resolved the second one by folding some paper to make a "spacer" that I slid between the track and wall of the unit - in essence, narrowing the distance between the tracks. Not exactly high tech, but I have not had any problems since. I should add that I am very happy with the performance of the unit and would buy another if more capacity is needed. Thank you, putting the "spacer" in worked beautifully! Agree, not high-tech, but it absolutely works!. This happened to us once. I took all of the bottles off and found that the edge that rolls on the runner was not extended perfectly. Fully loaded the tray and have had no problem since. Can this unit sit on a cabinet to get it at a higher level? BEST ANSWER: That is certainly a possibility. Keep in mind though that the cellar in itself, empty, weighs 174 pounds. When sitting on the ground, the top shelf is just below eye level for someone 5' 10". Which is it were you referencing in your height comment? We are looking at the EuroCave Premiere M Wine Cellar and I would have expected it to be under 5' in height based on the dimensions given. Since unit height is an issue for us, want to make sure there isn't something I'm missing in the dimensions. Yes. Just ensure you are accounting for the weight of the unit and weight of the bottles. Can you remove door to move the closet into a confined area or closet? Thank you. It's a very large closet with air conditioning vent inside. It's the door frame that is the issue. It appears the door can be installed on either side to open to the Left or to the Right. It requires some air circulation and there is a piece in the rear so you don't put it right up to the wall. Door can be taken off to move into space. Also can reverse the door swing. Need to be in well ventilated space. How do I change the humidity and know the humidity levels. Do I need to fit it with a hygrometer as well? Can this wine cellar be out in a garage that is not climate controlled? BEST ANSWER: I have had two units in my garage in Tucson -- Arizona summers are hot, -- one for about seven years, the other for about five. The controller (but not the compressor) just went in the older, but I am told that is pretty good life, so . . . Yes but, keep in mind that the glass door version is rated for temperatures not exceeding 85 degrees (the solid door can handle UP to 95 degrees). It's important to remember that the actual temperature in the garage will most likely be hotter than that outside the garage. In addition, this makes the motor work harder. No problem, but this shortens the lifespan of the cellar itself--at least in theory. My brother tried this with a different model and he didn't have good luck. The temperature differential is too high. Even when installled in an enclosed space inside the house, you should have a vent fan to evacuate the heat generated by the unit. I have this unit inside my house with plenty of clearance around it. It keeps a solid 55 degrees plus or minus 2 degrees. I am very happy with it. Yes. However, keep in mind that the glass door version doesn't keep temperature at the right spot unless the garage temperature doesn't go over 85 degrees. The solid door can tolerate up TO 95 degrees. Keep in mind that the outside temperature will be hotter than the garage temp. Also, It shortens the lifespan of the cellar as the motor must work overtime! Terry - I live in the Nashville, TN area and placed my EuroCave in my single car garage. I have not had any issues with wine cellar since I purchased the EuroCave 6 months ago. It has maintained temperature and no humidity issues. 800-377-3330 and one of our consultants are happy to help. My unit is brand new and when the compressor is running it makes another noise along with it. Almost sounds like trying to breathe through a snorkel. It lasts about 4 secs and then stops for 4 secs. Is this normal or should the unit be looked at? We’ve had our Eurocave M cooler for 2 years and it has never made any unusual sounds. In fact it so quiet that we do not hear it running at any time, even when standing next to it. If your cooler is making unusual sounds, you should call for service. That is certainly not normal. I’ve had mine for almost two years, and it is essentially silent. I do have a shelf that never seems to set correctly, and we can’t use it. Thank you for your question. Please call Wine Enthusiast at 800.648.6058 and choose option 2 to be connected to our technical department. I’ve had mine for two years and have never noticed this noise. How many bottles will it hold?? BEST ANSWER: Nominally 120 bottles on the 10 sliding shelves. If bottles are not regular Bordeaux style then one needs to become a bit more creative. I also get 10 to 12 magnums (1.5 L) in the bottom storage area of the cooler. The image shows three rows of normal bottles stored beneath the bottom wooden sliding shelf but that is really pushing it. Maximum ~140 but with the caveat that if any bottle is not standard size storage capacity is reduced. I have had this wine cooler since July of 2017 and am totally satisfied with it. The wooden sliding shelves are wonderful and the noise level is quite subdued. When it is working it tends to have a slightly high pitch but still quite unobtrusive. I have had at least 150 bottles in this cellar. I think it could be more. I have champagne on one shelf which occupies more space because of the bottle size so the total number capacity depends on the size of the bottles to some degree. Just over 100 reds. The larger cabernet and pinot noir bottles won't allow for full racks. Really not a problem for me. Very quiet and always within 2 degrees. About 12 cases or so. It definitely depends on whether you have a lot of Pinot noir bottles. Can this unit be placed into a wall? if so what is the recommended spacing top, sides and back of the unit. BEST ANSWER: I would not. It is rear vented. Thats not to say someone would put in into a wall. If so leave at least 4 inches all around. Have a dedicated circuit. I beleive if you put this unit in a wall the unit life span would be shortened considerably. I would always recommend a unit that is front vented. I put mine in the garage on a dedicated circuit with second unit. Works great winter and summer. It has an ambient temp range from 32 to 95 or so. The back of the unit needs to be at least 2 feet away from the wall for proper air flow. the top and sides are easy. The unit must be placed in a relatively cool place away from direct heat and sunlight. Hope that his helps. I have the unit free standing in my Florida garage but see no reason why it could not be placed into a wall. If you call the Wine Enthusiast specialists, I am certain they can tell you the appropriate dimensions. Can't help u with dimensions but am able to say that we built it in a coat closet. Works fine. They did leave breathing room tho. You would need to work with Wine Enthusiast Consultant for proper ventilation specs if building in. Can wine in a Eurocave be safely stored in a garage in which temperatures sometimes exceed 100 degrees F? BEST ANSWER: I have my Eurocave inside. I previously had a much less expensive wine chiller in our garage that exceeded 100 degrees over half of the year. That unit performed with any problems for years. A year ago I gave it to my neighbor who also has it in the garage and it works without problems. I would advise calling Wine Enthusiast to get their expert opinion on the Eurocave's ability to function without problems in extreme, prolonged heat. I think that temperature differential exceeds the design specs. Life span of a V264 wine refrigerator? BEST ANSWER: I am considering a second one now because our collection has grown, but we've had a Eurocave since 1999 and it's working great. I think it helps that it's been in the same spot all along. How well would this unit work if kept in a garage in a hot humid climate? BEST ANSWER: I live on the Texas Gulf Coast and keep a EuroCave Premiere M cellar in my garage. My garage is insulated, but otherwise isn't conditioned. I do keep the garage door closed in the summer to keep the garage internal temperature from reaching ambient outdoor temperatures. The EuroCave cellar has functioned very well, maintaining the desired 55 degree internal temperature without significant variation. The Eurocave folks talked me out my garage because during the summer the temperature would be over a hundred degrees. I have the unit in my house now. Beware though, it's not a wine refrigerator, thus the temp fluctuates in the unit a few degrees. That was strange getting used to. Do not expect the unit ti stay at 55 degrees all the time. Our EuroCave is kept inside the main house. The manual we received with the EuroCave indicated a recommended temperature range between 32-86 degrees for a glass door and 32-95 degrees for a solid door. Your vendor's sales professional might have additional information. Will the individual shelves easily hold the largest size champagne and pinot bottles without scraping against the top shelf? BEST ANSWER: I have Pinot bottles from three different wineries and do not have any issues with the bottles scraping the bottom of the next higher shelf. These MDS rolling shelves should provide you with tremendous flexibility to store those type of bottles. However, if you need more space i would recommend taking a rolling shelf out to give you move flexibility. I cannot address your pinot/champagne specifically, but I can tell you that I have some chardonnays in the fridge that measure 3 1/8" in diameter and they are a snug fit in the rack. Anything larger would not fit. Sorry. My answer was for the 28 bottle model. Thank you for letting me know. The sales rep at EuroCave told me the individual shelves can be adjusted to fit any size bottles. I asked again to be sure this wasn't just the holders on each shelf that can be adjusted to hold the bottles so they don't slide around, this is when they verified the actual shelves themselves could be adjusted on the sides. Is this true? It will be the first wine refrigerator / cooler / cellar that I've seen able to do this if so which is a great feature. Sorry, my answer was for a 28 bottle model. On the 28 bottle model, there is the ability to remove a rack and adjust their spacing in (about) 1.5" - 2" increments to accommodate larger format bottles. Doing so would reduce the capacity to something less than 28. I just put a Pinot into the unit and it fit...snugly. Big help with the clarification, thanks! I read in the manual that the spacer ensures 7 cm (~2-3/4") behind the unit. Can someone tell me for certain whether this means the actual total depth required for this unit is 27-1/4" + 2-3/4" = 30"? The reason I wonder if it is somewhat less than 30" is that the 7 cm spacer is afixed to the back top of the unit and within that spacer depth is the evaporator (grille) that I assume is included in the 27-1/4" depth. I have a maximum depth in my planned location of about 29". Thank you. Richard, is that 28-3/4"? Thank you. does this cellar allow for humidity control? Yes, all Eurocave wine cellars will maintain relative humidity. No. You will need to humidify it on your own if you live in an area where thst is an issue. Can you purchase another shelf for this unit or can you purchase a presentation shelf? BEST ANSWER: I haven't done it, but I believe the racks are adjustable in height...but that means you not come close to reaching the 141 bottles promised for this model. Yes we can certainly get you extra shelves for this unit whether it be rolling or a presentation shelf or an adjustable shelf. How is the humidity inside the unit maintained and adjusted? BEST ANSWER: The answer from John explained how humidity is formed and where it "goes" (viz 'adheres to internal aluminum walls', but ignores the question of how it's ADJUSTED. Since his statement says it adheres to the aluminum walls is he saying it therefore is NOT a problem and doesn't have to be adjusted? If that's the case then the answer is correct, but it's not obvious to a layman. Is the humidity's adherence to the walls a solution. Having the correct humidity for wine storage is important. Too little and corks dry out and air seeps in, too much and mold can form on the corks. I'd be very interested in a more complete answer before spending thousands on a unit without a humidifier. When the warm air from outside meets the cool air inside condensation forms naturally and adheres to the internal aluminum walls. what amp outlet is reuired to plug this unit into? BEST ANSWER: This unit requires a 15 amp dedicated circuit as well as a 110 V three prong outlet. 120 I think. Standard wall outlet. how many bottles of wine can this hold? BEST ANSWER: As photographed with 10 rolling and the bottom of the unit the capacity is 141 based on Bordeaux bottles. If you use a combination of bottles sizes that capacity will change. I would also suggest a capacity approximately 120 or 130 bottles. I'm interested in a high quality wine fridge for both red and white wines. The fridge will be for long-term storage but I want to be able to pull any bottle and have it be at an appropriate drinking temp. Is this the correct model? Eurocave is definitely the best choice for long term storage! You may want to consider the Eurocave 5290 Professional Dual Zone model. The item number is 282 29 01 3X. Yes, this wine cellar will fit those needs. I need to buy a new charcoal filter. Where can I buy one? You can either place the order on our website or call your order in. How many sliding shelves come standard with the EuroCave Premiere M unit? Where do I find size specs? BEST ANSWER: The specs are listed under specifications which is located on the units landing page. Please see the specs below. What is the difference between the type M and type L? I am looking for a 28" wide cooler with about 68 to 70 inch height, is this size available? Where can you get it serviced in the Charlotte area? Highly recommend this unit. The "Hand of the Sommelier" shelving system allows bottles of various sizes to easily be accommodated. The unit is extremely quiet - you cannot hear the compressor when it is running. The EuroCave construction is first rate and the company's reputation is well earned. Although the unit does not have a humidifier, I placed a moistened sponge in the storage area below the moveable racks and this enables a proper humidity level to be maintained in our very arid climate. Unlike most of you, I purchased this wine cooler in January 2002; and it has served me well since then. I have never had a problem with it, except to replace the little battery every 12-15 months. In fact the reason I am online is to purchase another smaller version, since I am running out of space!! My only regret is that is not a smaller version of this Euro Cave. I hope I have the same good fortune with my next purchase!! I belong to seven wineries (used to belong to 13) and have had MULTIPLE stand along single zone and dual zone wine cabinets. It would seem that they ALL break after their warranty is done. THIS WINE FRIG LOOKS LIKE IT SHOULD BE THE EXCEPTION. It is certainly nicely made and the shelves are superb in their design. I conducted an exhaustive search for a wine cooler that would accommodate the Burgundy size bottles and just about gave up. I am a design engineer and cannot understand why cooler designers just don't get it. I was told the Euro Cave had adjustable shelves and could be modified for the bigger bottles. Several other brands advertise that their coolers can accommodate the larger bottles but watch out it is not true. I started loading my new EuroCave single zone medium cooler and it easily holds the Burgundy bottles with about 3/8th inches to spare. No adjustments are needed. In fact, it comes so close to holding a Champaign bottle but just barely nicks it. It actually works as the drawer still easily open without pulling adjacent drawers open. I can also "feel" the better quality. The only thing I don't understand is why Wine Enthusiast does not promote this feature. It really separates this cooler from all the aggravatingly under designed misfit coolers. I can comfortably load any wine (standard) in this cooler and stash the Champaign bottles in the bottom open storage area where they belong in a single zone cooler. This is a great and fun cooler. It's a bit louder than I thought it would be, though it really isn't an issue. Let it sit 48+ hours as instructed and after turning it on it cooled from 72.3 F to 55.1 F in a very short period of time. Storage capacity is based on 750 ml Bordeaux bottles. Those bottles of Australian Shiraz and California Cabernet will greatly reduce storage capacity, so I'm glad I got an M model instead of an S.
The instructions come in several languages, though the translation to English left much to be desired. Be prepared to figure some things out yourself. The people who performed delivery did a great job. I can't say enough about them. They worked efficiently and were polite and careful with the product. The people who called to schedule delivery did a poor job. They confirmed a Friday delivery between 3-6 pm, but then said I was never assigned to the driver's route. I asked for delivery Saturday between 3-6 pm and was told it would happen and they would call to confirm, but they never did. The driver called me at 8:15 a.m. Saturday and said he would be arriving in 30 minutes. We were about to walk out the door (which is why I wanted delivery in the afternoon) and had to go back inside and wait for delivery. I was to receive a four-pack of charcoal filters but they were not included with the delivery. I contacted W.E. customer service two days ago but as of writing this nobody has responded. In short, the purchase process was fantastic. Actual delivery was fantastic. The product is fantastic so far. Customer service has thus far been non responsive and the schedulers for delivery did a very poor job. 6 1/2 years and going strong! I purchase a Performance 183 in October 2009. I've kept it full, clean it out once per year and change filters. Perfect for my small porch in a condo setting. Can't recommend this product enough! This EuroCave is what we should have purchased twenty years ago. It is inside, do not hear it, looks great and keeps the temp. Plenty of capacity, easy to use, right size, quiet. This holds a lot of Bordeaux bottles but those blamed Riesling shapes take up more than their fair share of space. Great purchase. Performance is as advertised. After much research and comparisons with other brands, I went with the EuroCave Premier M. It was the size I was looking for and in the price range I wanted. It is performing just as advertised. Really quiet, smooth rolling shelves and sleek design. I especially have come to like the individual bottle cradles that are easily adjustable by sliding side to side and equally easy to remove as needed. I had a free standing cabinet made from reclaimed south Louisiana cypress that it now sits in and makes a beautiful showing for my collection. I would definitely advise anyone looking to properly cellar their babies to strongly consider EuroCave. The customer service during the ordering process was handled by a knowledgeable person who answered any and all questions I had before the purchase was official and I have been contacted a few times since to make sure the unit is delivering as designed. WineEnthusiast is excellent to work with. There customer support is exceptional when working through a challenge with a previous small entry level cooler that no longer worked. They offered a solution to assist in a refund and most importantly they listened to my needs and goals. The EuroCave Premier M selected meets those goals, exceptional slide out shelving holding various bottles sizes, a statement piece and frankly the investment is worth it. Very Quiet, great delivery service, easy to program. My one challenge is the plug became dislodge during shipping and not discovered until two days after installation. Once delivered you wait two days for fluids to settle before plugging in and powering up. Be sure to look closely at bottom left grill before delivery crew leaves. Easy fix if’s a weekend when you’re ready to power up! I spent a few months looking into purchasing a wine cellar. There are so many options, most of which are much less expensive than this one. However, I wanted something that would look nice enough to be put in a formal dining room to avoid carrying cases of wine up and down the basement stairs, but also ultra quiet since we work from home in an adjacent room. This is a very solid unit, nearly silent, with great shelves. I also wanted a wine cellar that would not need to be replaced in a year or 3. I think this purchase will be well worth the investment. Delivery was fine, they put it all together and took away all the packing materials and set it exactly where I wanted it installed. I wholeheartedly recommend this wine cellar with no reservations. This is not our first EuroCave. We needed additional storage. Highly recommend! I just received it two weeks ago. So far it’s working very well. It looks great, is very quiet, the rollout shelves work well after a little initial adjustments and the temperature holds within about two degrees. At this early stage, I would highly recommended it. The Wine Enthusiasts people and the product. (EuroCave Cellar)were a positive experience. The free white glove delivery was a complete nightmare. The "in stock" cooler took 6 weeks to get delivered and the sub-contracted delivery people were unreliable and impossible to work with. Should have just had it shipped to myself and put it in myself. If I had done that, it would have been a 5 star rating. So far I am very pleased. The rack system and drawers are high quality and very smooth. Temperature has maintained between +/- 1 degree of setting. Glad I spent the extra dollars for this wine cabinet. Absolutely the best wine cooler we have ever owned, and we have had many less expensive brands that did not perform very well, were noisy, and did not last more than a few years. The Eurocave is exceptionally quiet, maintains selected temperature, easy sliding drawers, and we fully expect it to perform well for many years. So far so good. Looks great and temperature is constant. Love the adjustable shelf system. So far so good. spacious, maintaining temperature well. what more can you want. Bought it for hubby from Santa. He loves it so much he wants it in the middle of our dining room. As lovely as it is, the size is a little large for a 'design feature' in the dining room so it stays in the man cave. The fridge itself of not noisy and very nice aesthetically also. It works beautifully to take care of the precious wines we collect. Great wine cooler if a bit pricey. Very quiet with sleek design. This cabinet is a perfect fit for my wine-drinking needs. It is sleek, quiet and fits perfectly between my countertop and floor-to-ceiling cabinet. It's basically an expensive refrigerator but my bottles are stored in an ideal temperature and humidity. You shouldn't expect less but you needn't worry about your investment. Great wine fridge! It’s the second we’ve bought, and the new bottle ‘nests’ are really nice - you can move them and even remove some from the shelves for fatter bottles like Chardonnay. I like my Euro Cave but am not happy about the drop in price less than 30 days after purchase. Like most other people who have bought Euro Caves, I depended on the reivews like I'm wiriting here as well as finding a few people personally who own them; so far it's lived to its reputation; I think it's FAR quieter than I expected, which is really nice. The storage space on the shelves is wider than I also expected and I have been able to get burgundy/syrah size bottles in without them touching adjacent shelves. plus you have room for the 120 on the 10 shelves plus another 15-20 on the bottom. I was concderned about the instructions only talking about centrigrade and so called Wine Enthusiast and got instructions on how to change to Fahrenheit; but after the 48 hour waiting period after delivery, when I started up the unit, it read Farenheit so I didn't have to go through that change process. The unit has constantly been with +/- 3/10ths of a degree from wehere I set it ( 55 ) so that's really good, too. I feel vewry good about my slection and expect MANY great years of performance with this brand !! * Shelves are spaced to allow for Pinot or other large bottles without having to move / lose shelving. This is so important. * sliding wine holders accommodate any mix of bottle sizes ad support the bottles very well. I love the size of this M unit - doesn't overwhelm a room with height. Overall extremely pleased with this purchase. Honestly, I can’t say anything negative at this point. I doubled down on two of them for need and increased my wine collection. Keeps the temperature stable. Easy access to the wines from top to bottom. Attractive, ambidextrous doors, sturdy sliding trays. I ended up putting this unit in my home office and I cannot tell even when it is running. Keeps temperature well and really is just a great unit so far. Only has been a short time but really impressed. So far so good. It's only been operating for two weeks but once the temperature stabilized the temperature has remained fairly constant. The fridge is very quite and the cabinet is attractive and well made with a quality feel. Great cooler but does not store Pinot and Rhône bottles very well. It is very quit and finished well I would certainly recommend this product. I originally ordered a single large wine cellar which didn't fit in space. Lucky for me because the two EuroCave Cellars are far superior. I would definitely recommend them. Everything so far is as promised. Nice quality. Quite. Sturdy. Purchase was easy and the product arrived with white glove service without a hitch. Installation and setup was a breeze. The EuroCave Premiere M Wine Cellar works great. Holds love of bottle and the bottom area great for oversized bottles. Great purchase. The cellar is as advertised; however, getting it was an issue. It took four weeks instead of two, and when delivered, it was wheeled in the door and left. We were informed "not our job." And they left before we got it plugged in and checked for any shipping damage. Fortunately, all was well. I don't believe where we live should have been an issue as that information was known when we ordered the cellar. Luckily, we are enjoying the cellar and all is well. So far I'm happy with this cooler. Much quieter than the one it replaced. Storage, as many have noted, is based on the size/shape of the bottles. I'm guessing, once filled, I'll get in the 110 - 120 range. The top 2 drawers were not pulling out easily after first delivered. But there are adjustments that can be made and it just took a minute to change the width of the drawers so that they now slide easily. It took a little longer than promised to arrive but worth the wait. Very happy with the unit. Have only had it for a couple of days and waiting for the temperature to settle in. The white glove delivery as mentioned by others left a little to be desired. They were very nice and placed it in the location I wanted, removed all the packaging material but they were in an awful rush to leave barely gave me time to look it over on the outside and didn't have much time to ask questions. Once they left I noticed the door was nut flush, called wine enthusiast they called a serviceman and I actually was called back the same day and they arrived a couple of hours later, he adjusted the door and was very happy to answer all my questions. So far very happy. Have only had the unit installed one week, but so far has met my expectations. Very little to do for installation, runs quietly, rolling racks held my red wine bottles. Solid and well built unit. I like the product. Is well done . However the price 300% of your competitors may not be justified . I am very happy with my selection of the Eurocave. I looks great in the house and has just enough space for my needs.